This is a great improvement and replacement for the standard STI C-More mount. 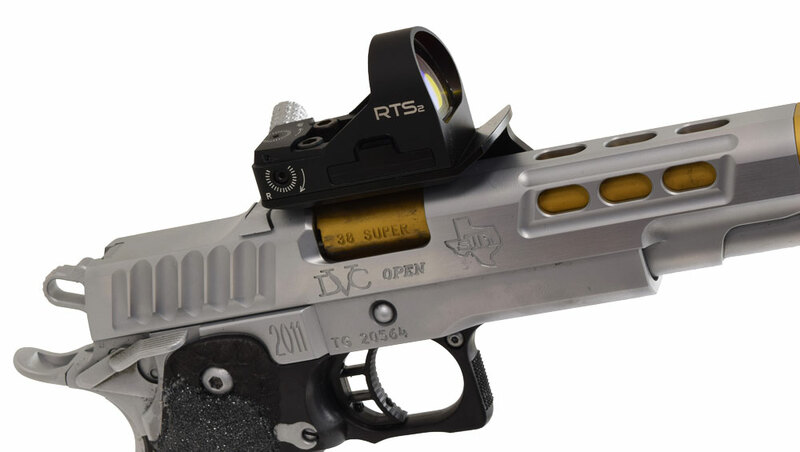 With the RTS2, the dot becomes about half of the lens lower, making aiming and finding of the dot much more easier and quicker, especially using strong/weak hand only. Moreover, it is much more compact leaving the ejection port completely uncovered. Black colored version looks great on top of black gun. As compared to the STI mount, the attaching screws have to be shorten about two of millimetres, be sure that there will be absolutely no protrusion of the screws through the frame, otherwise the fore end of the slide will be scratched. The DAA RTS2 2011 mount is machined from solid aircraft grade aluminum to ensure long lasting durability and precision. The mount is designed to allow just 2mm of clearance above the top of a flattened 2011 slide, so may be a tight fit if no material has been removed from the top of your slide. 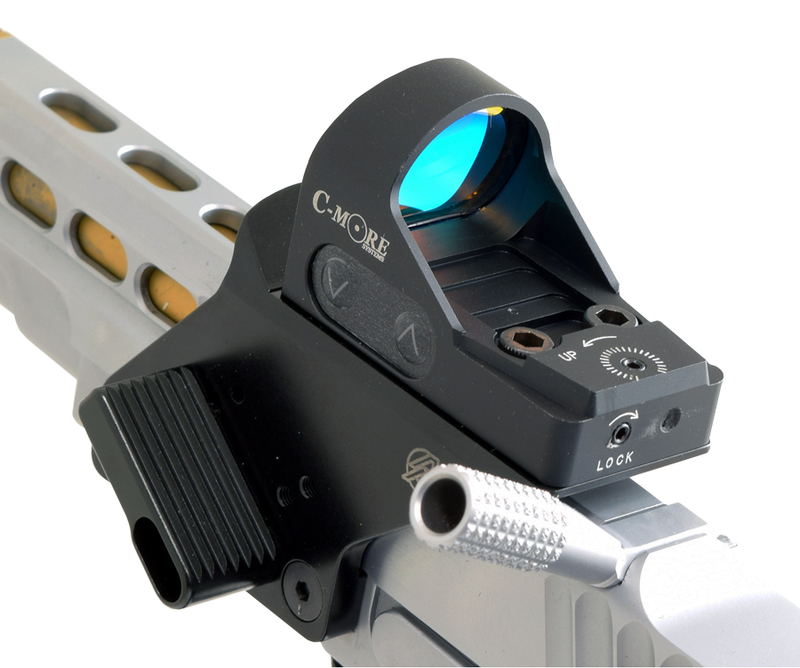 The scope mounting surface includes locating pins which have been machined directly from the solid mount material to ensure precision and a perfect fit to your C-More RTS2 scope. 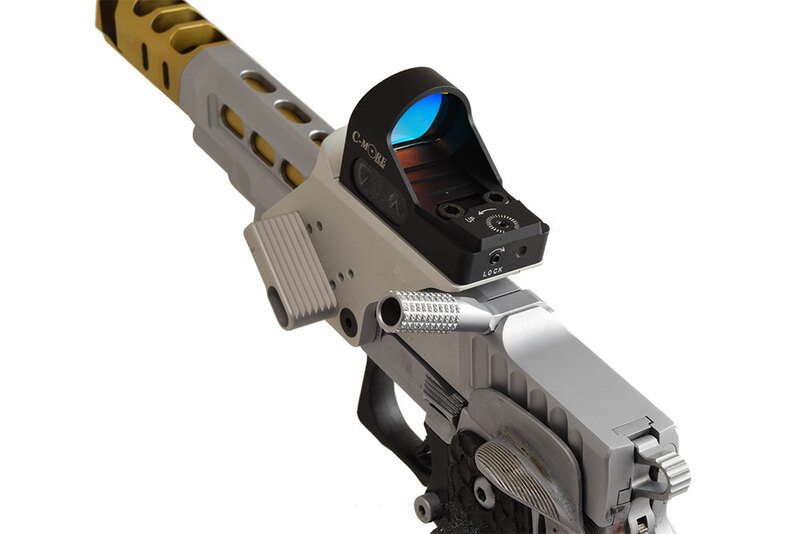 A compact yet functional blast shield is incorporated in the mount, to help deflect muzzle blast way from the lens of your sight. A serrated, wide thumb paddle is included, and several mounting holes are available to allow you to position the thumb rest to best suite your preference. More than 20 height and angle combinations are possible. 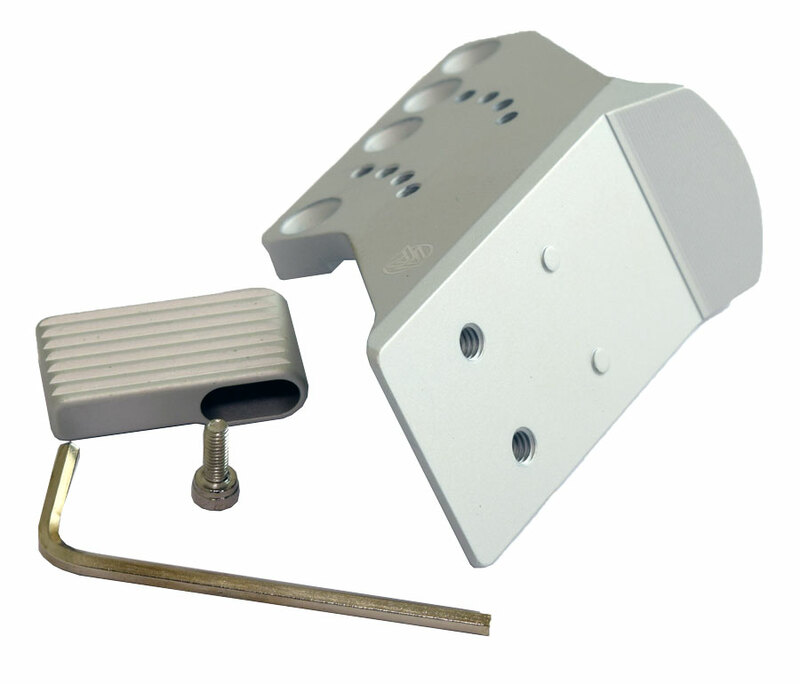 The thumb rest is attached using a steel pin and an M3 socket screw (included). Or, should you not with to use a thumb rest you can certainly leave it off the mount. 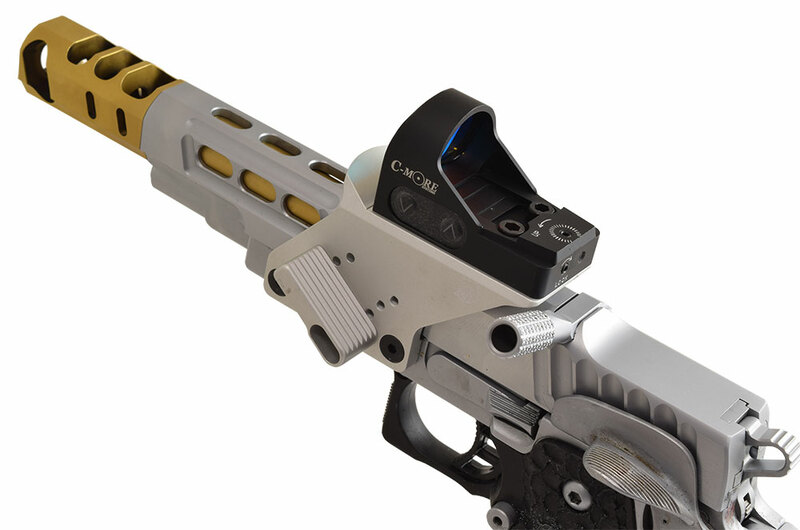 The mount is designed so the scope is aligned with the center of your slide and as low down to the slide as possible. 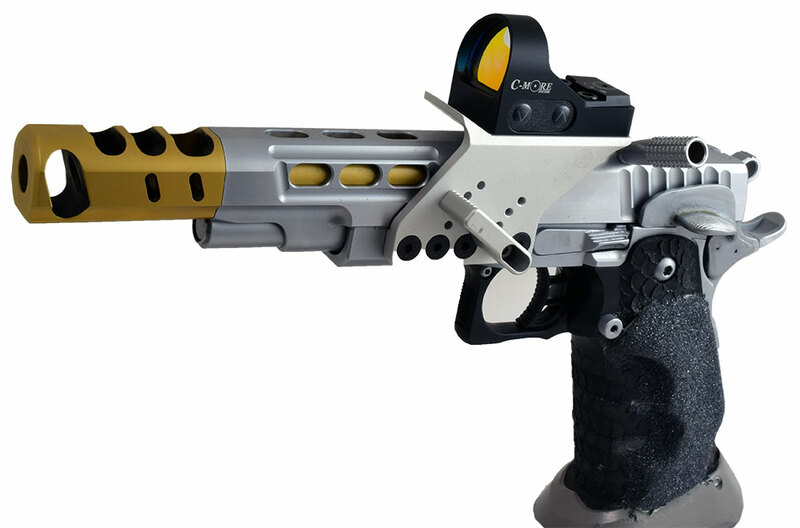 It is designed to allow a forward-positioned Slide-Racker (as supplied with the STI DVC Open guns) to fit with the mount in place, allowing the Racker to be used on the left side of the gun too, as most right-handed shooters prefer. The mounting hole pattern is the Standard C-More pattern, with a 4th hole added between the forward and middle holes. Due to the wide variety of mounting screws and threads in use – mounting screws are not included with this mount. Use screws that fit the threads your frame already has, or as recommended by your Gunsmith when drilling and tapping your frame. We recommend the use of M4 Torx screws. 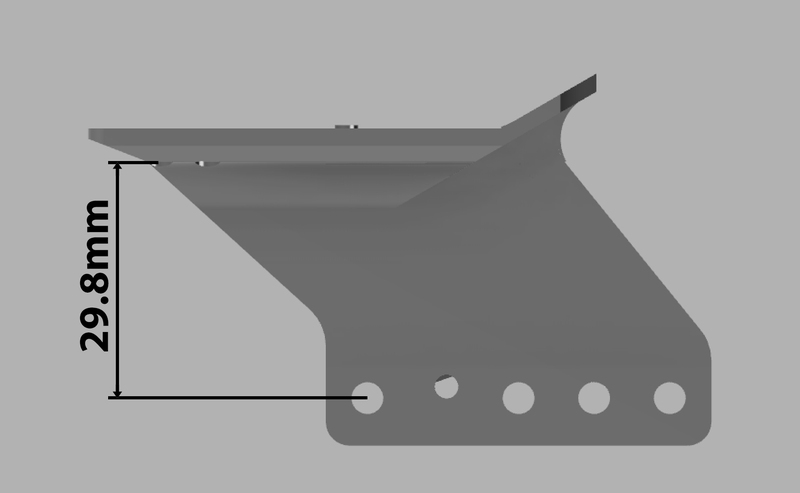 The height of the mount, from the center of the mounting holes to the underside of the scope platform is 29.8mm. Note: also fits C-More STS scopes.